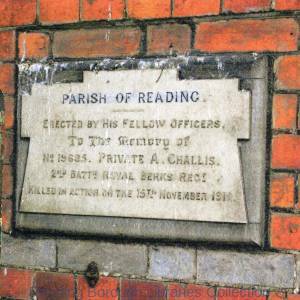 A memorial plaque on the gateway to the former Battle Hospital in Oxford Road, Reading, photographed in 2010. It commemorates Private A. Challis, on the 2nd. Battalion, the Royal Berkshire Regiment, who was killed in action, 15 November 1916, during the First World War. Private A. Challis, on the 2nd. Battalion, the Royal Berkshire Regiment, who was killed in action, 15 November 1916, during the First World War.